Large 4 bedroom Cottage with loads of character. With assisted wheelchair access to the property it has 2 lounge rooms (both with TV's), 2 Bathrooms, separate dining and reading rooms, 3 outside porches with lots of outdoor settings and gas BBQ and a large backyard. Fully equipped kitchen with a large fridge, oven and stove top, dishwasher, microwave, lots of crockery and cutlery. Driveway for 3 cars, extra parking will be advised. NO parking on the front lawn. DVD, CD player. Gas heaters for a cozy winter getaway. Ceiling fans or fans in all rooms. Ideal for families, couples, get togethers. Be Quick, dates are filling now. **Please note the calendar is updated when each payment is received. Please feel free to check any dates. Min stay is 2 nights for most periods, however if you would like a 1 night only stay, please put an enquiry through and I will reply there and advise if this is possible. $35 for a pet during other times - Pets on request only. No menageries..
**Some Saturday, Sunday & Public Holiday arrivals - may have additional $150 (cleaning and check in fees) Please enquire first. Midweek outside school holidays February: Min Stay 4 nights ($150 per night Mon - Fri night; $375 per night Friday, Saturday nights, Sunday night $200) for up to 8 people. Be Quick.. mention this sale and we will adjust the rates. For shorter or longer stays; put an enquiry in and we will re quote for you. WHEELCHAIR ACCESSIBLE into house, back yard, bathroom (inc. shower chair), front living room, dining & reading room..
LINEN IS AVAILABLE $11.50 PER PERSON FOR THE WHOLE STAY (top, bottom sheets, pillow slips. Beds will be made up ready for your arrival) Please bring your own towels) A separate email will be sent to you regarding linen. Situated in a quiet street in Gerringong, 10 minutes south of Kiama. 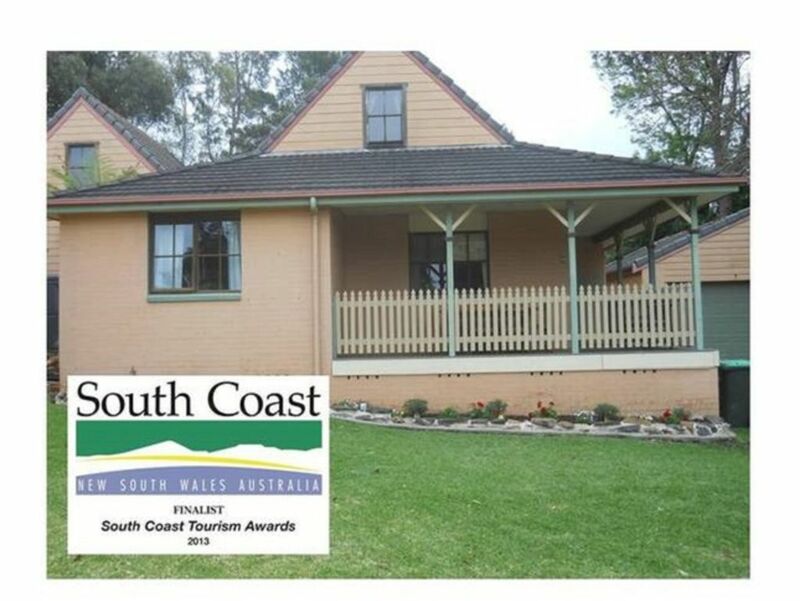 Only 5 minutes walk to Beautiful Werri Beach and near shops, cafes, great bakery, supermarket and restaurants. Famous surfing beach: Werri Beach. 10 mins to Kiama Blowhole. Short drives to Berry, Gerroa, 7 mile Beach and Jamberoo. NEARBY LOTS OF AWESOME WINERIES. I'm so sorry for my late reply. It seems that the the conclusion of the holiday brought the reality of hard work very quickly. However, i just wanted to take the time to thank you for your hospitality last week at the cottage. Everyone commented on how beautiful and spacious the house was, and eagerly they want to return. The house provided the backboard for a wonderful holiday. Indeed we had a lovely weekend at your place - it is in an ideal place and well set up for large groups of people. "where back for another year after our great time this year"
We had 7 this year and every body had the best time We will have 5 coming from nz next year so at the moment we have 10 or 11 but we will cap it at 12 at the most. All is good. The house is sensational. We had a great family holiday- the place was beautiful. We all are planning to visit there for our next holiday. Thank you for your assistance with the holiday accommodation and it was nice talking to you. Thanks for a great accomodation, we all had a great time and if in future we go to gerringong again would be delighted to book accomodation from you again. The weekend away was fantastic, very relaxing and the place was an excellent set up to accomodate us all. We will stay there again as it was just so relaxing and peaceful. I will certainly recommend the place to others especially as it sleeps So many. outstanding layout of a house that suited our stay perfectly. Parking for 4 cars only. No parking on the front lawn at all. 3 in driveway, 1 on Council Strip. Accessible into the property, first living room, dining, 1 bedroom, reading room plus accessible bathroom. Also accessible backyard to enjoy the space. Kids and dog had a great yard. Outside BBQ was a great area to cook and entertain. Loved that the kids could watch TV one area and adults another so we had no arguments there. We thoroughly enjoyed our family weekend. What a lovely review Jan. Thank you. It was so nice chatting with you before the stay so we could discuss the booking. So happy that the wedding went well as well as you all enjoying the accommodation. It really is a great property for a large group as well. I am fortunate to have Danielle who prepares the property so well for guests to enjoy and feel comfortable. I am looking forward to helping your family and friends with a special offer for a future stay. Have a lovely Easter Jan.
A perfect house to entertain and stay with a large group. Great location, large living rooms made having everyone in the same room easy to do. Cheryl was very accommodating and easy to get in contact with. Very happy you all had a great getaway. Let me know when you would like to stay again and I will have a returning guest offer for your group. Spacious, perfect location and a terrific price to go with it. Absolutely perfect for coming down for a week or so with around 7-8 friends. Its incredibly spacious both inside and especially outside so you're never left feeling claustrophobic. Its about a 5-10 minute walk to the beach and about a 15-20 minute walk to the local shops and restaurants. Would definitely recommend if you're planning a week away with some friends/family for a great price. Thank you so much for the lovely review. That is fantastic that you had such a great week away. Gerringong really is a piece of Heaven where the Mountains meet the Sea. Very happy that you enjoyed the house as well. I will have a returning guest offer if you or your friends would like to stay again. Great for my family aged from 6 to 84 plenty of room for all. Needs a bit of attention to plumbing with leaky shower and taps and gutters need clearing which may be why roof leaked although the rain was quite bad that week, also bins need a good clean they were full of maggots from previous tenants over Christmas but with a few tweaks it is a great place. Thank you for the feedback. We are glad that you had a great stay despite our unfortunate situation with the crazy storm that week. We attended to all immediately so all good now. We are fortunate to have a great cleaner and maintenance crew who continually improve this property for future guests. Great reviews are consistently coming in with many returning guests. Once again, thank you for your feedback.